UDM Downloads > PianoFX STUDIO! PianoFX Studio 4.0 is a powerful Piano and Music Keyboard Synthesizer for the Personal Computer. You can play and record live music using your PC keyboard or mouse without the requirement of a conventional Piano. The Piano Keyboard Interface has been designed to exactly resemble a fully featured Professional Keyboard Synthesizer. It produces a ultra-high quality sound output with 127 different realistic Musical and Percussion Instruments, 4-note Polyphonic sounds, a Drum-synthesizer machine, multiple sample Melodies and has Recording option to save your musical compositions in file format. The software runs on all Windows Operating Systems has been designed for ease of use and flexibility. 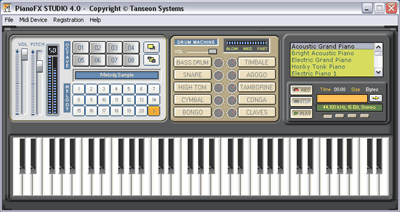 Features include Realistic full-size 64-key Piano and Keyboard Synthesizer, 8 Octaves of Musical Note output, fully featured with Ultra-high quality sound output, 127 different Musical and Percussion Instruments, variable Pitch and Volume adjustment, sample Musical scores and Melodies built in, embedded 10 Drum-Machine synthesizer available, record and save music compositions as .wav files. MIDI Mapper or Microsoft GS Wave Table Synthesizer. The software works on all windows platforms with any standard sound-card or onboard sound.